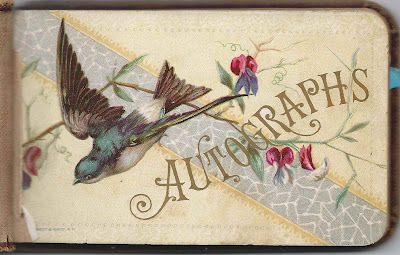 Autograph album of Evelyn Eliza Hicks of Maple Point, Boyden Lake, South Robbinston, Maine. 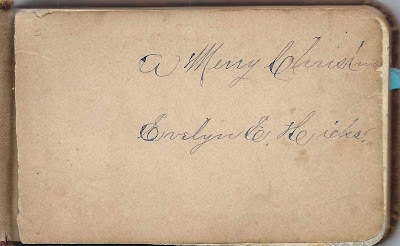 Approximately 5-1/2" x 3-1/4", with a page signed by Evelyn herself and 47 others, from Maine, Massachusetts and Wisconsin. Evelyn Eliza Hicks was born about 1872 at Robbinston, Maine, perhaps in South Robbinston in the area of Maple Point on Boyden Lake. 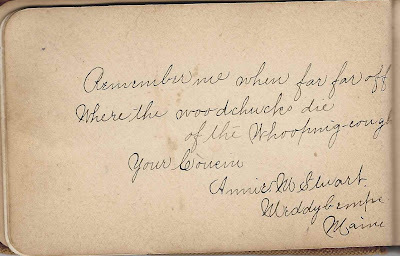 Her parents were Valentine and Mary Ellen (Noddin) Hicks, born at Buctouche, Kent County, New Brunswick, and Deer Island, Charlotte County, New Brunswick, respectively. 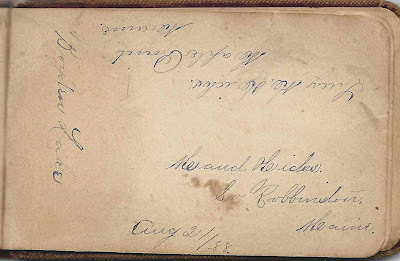 Her paternal grandparents were Israel Hicks of New Brunswick and wife Abigail (Carlisle) Hicks, born at Meddybemps, Maine. 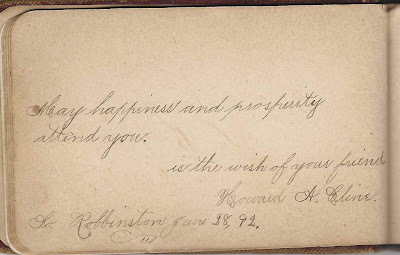 Her maternal grandparents were George Noddin and Eliza (Lord) Noddin of New Brunswick; they moved to Robbinston, Maine. 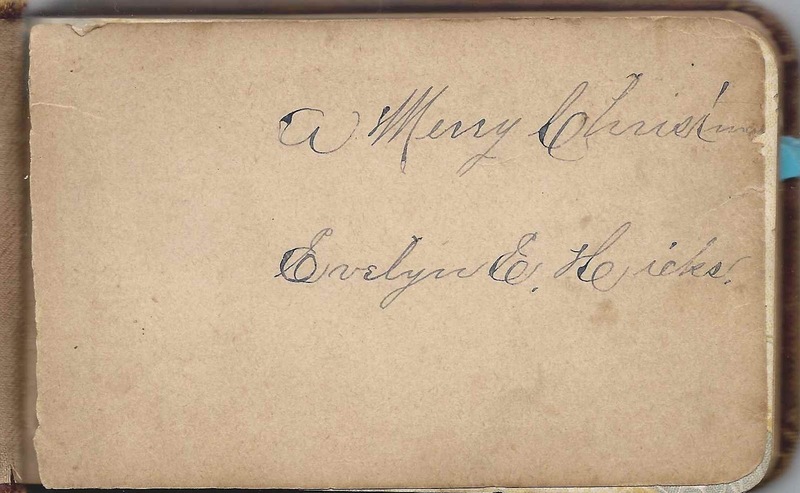 Evelyn's sisters Carrie Maud Hicks, who married Clifford S. Lovell, and Lucy M. Hicks, who married Howard A. Cline, signed pages in the autograph album. 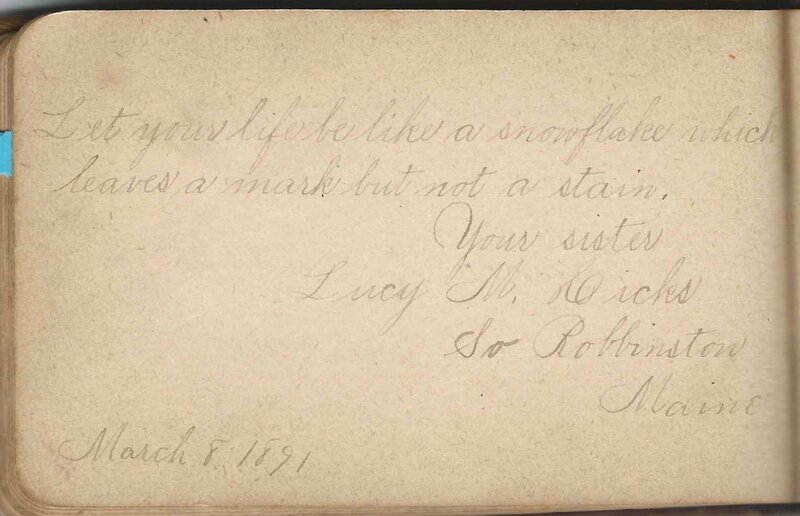 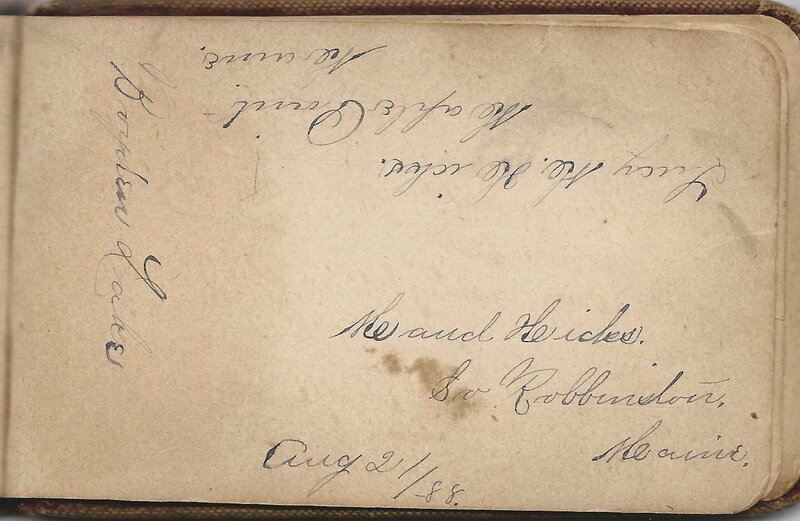 Howard A. Cline, future husband of Lucy M. Hicks, signed a page. In 1894, Evelyn Eliza Hicks married Walter F. Anderson, son of George and Mary J. Anderson of Stoneham, Massachusetts. 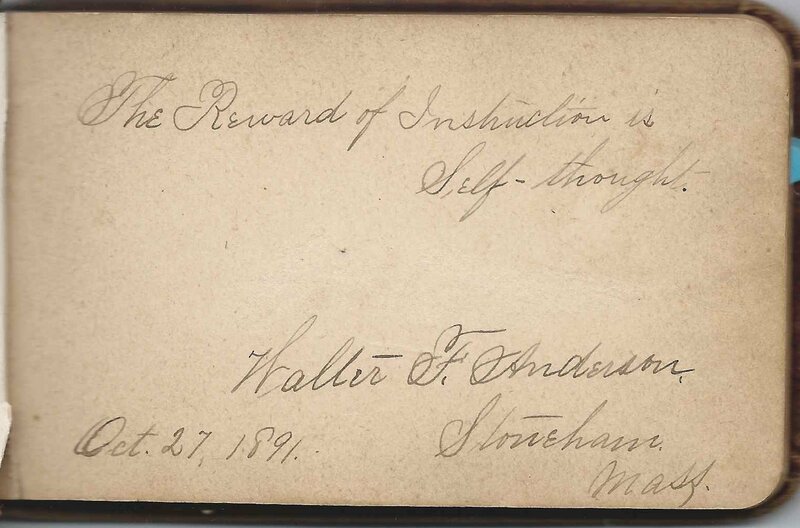 Walter signed two pages in Evelyn's autograph album, below. 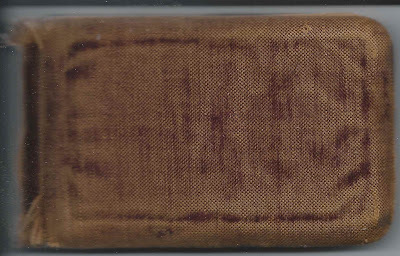 The couple lived in Massachusetts, New Hampshire and Maine. 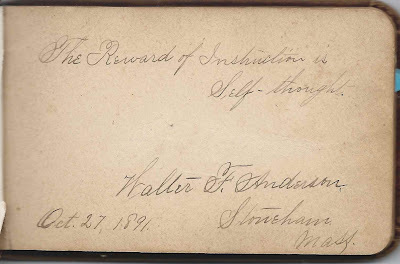 The 1900 Census found them at Stoneham, Massachusetts, where Walter was employed as a shoe laster. 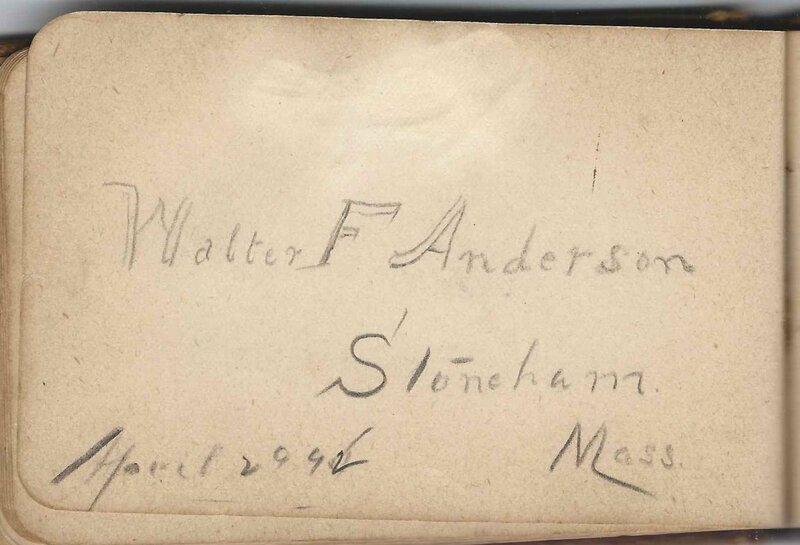 In the 1910 Census, they were living at Parsonfield, Maine, where Walter was working as a shoemaker. 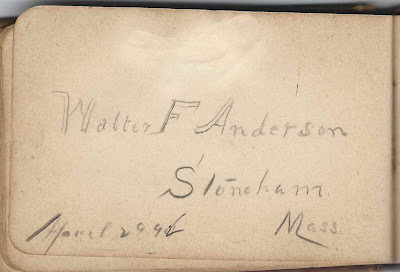 The 1920 Census found them at Farmington, New Hampshire; Walter was still working in the shoe industry. 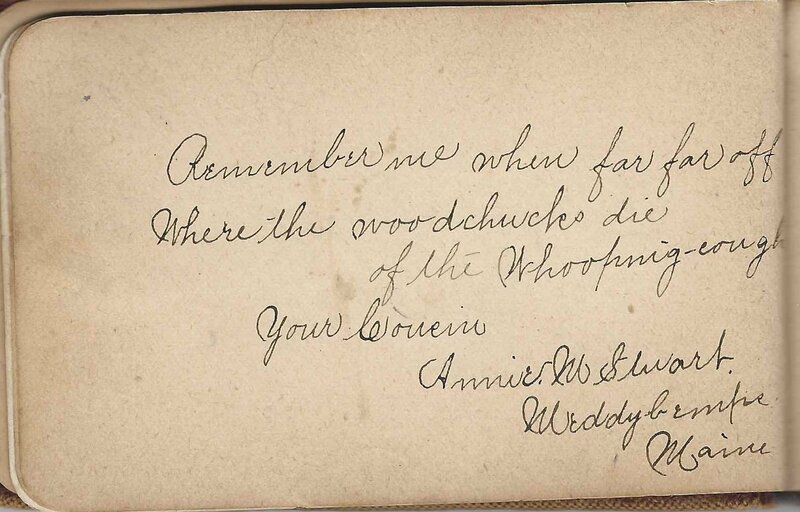 The 1930 Census found them farming poultry at Buxton, Maine. Two signers identified themselves as Evelyn's cousin; more relatives signed, but didn't identify themselves as such. 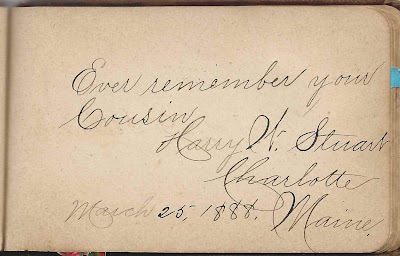 For images of all of the pages in Evelyn's autograph album, see the page of Evelyn E. Hicks at the Maine and Maritime Canada Genealogy network. If you have any corrections or additions to the information above, or if you have information on any of the signers in Evelyn's autograph album, please leave a comment or contact me directly.